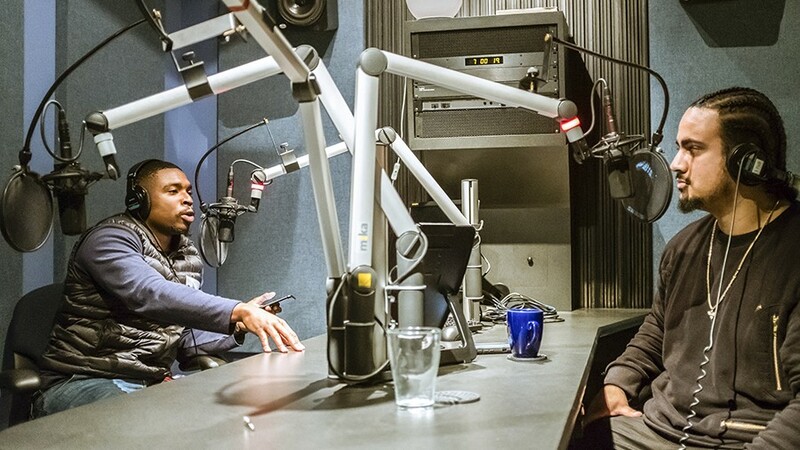 Delency Parham and Blake Simons turned their casual conversations into a popular podcast. Delency Parham (left) and Blake Simons met at a protest demanding the name change of Le Conte Hall at UC Berkeley. Two friends who often discussed politics, Oakland, and the need for Black political education have turned their casual conversations into a podcast that has garnered more than 30,000 plays on SoundCloud, despite having released just nine episodes and operating on a limited budget. The Hella Black Podcast, started in 2015 by Delency Parham and Blake Simons, has slowly garnered a devoted fan base. The two met at a protest demanding the name change of Le Conte Hall at UC Berkeley, and the implementation of institutional changes to address the Black student population at the university. At the time, Simons was a student organizer with the Black Student Union at Cal and Parham was reporting for Berkeleyside. With similar backgrounds and political views — Parham and Simons both have family members who were Black Panthers, and both share Bay Area roots — their friendship developed organically, and they decided to put their ideas together and spread them to the Black community. "We were two young people passionate about Black people and Black liberation," Parham said during a chat in Oakland. The Hella Black Podcast is no ordinary listening experience; it's centered on Black political education. Both Parham and Simons have strong radical thoughts that they share in the form of a casual conversation. There's no editing and no sugar-coating, and the goal of empowering Black people is evident in every episode. "We wanted a larger medium to reach more people," Parham said, "to provide political education and Black-purposed content." The realness of their conversations has helped build their fan base. While there is an abundance of media that addresses the Black experience, much of it focuses on entertainment and music rather than politics. "You don't see a lot of radical Black thoughts being covered by mainstream media," Simons said. "Even if you look at something like the death of Mike Brown, there were millions of tweets about Black people before CNN picked it up." Parham and Simons also don't limit their topics to the Black experience from a heterosexual male perspective; they dive into the intersectionality of being Black and queer, as well as issues of white supremacy and overall systematic oppression. "We talk about the conversations that are hella uncomfortable, especially as two Black males," Parham said. "We talk about consent, our alliance with the LGBTQ community, hyper-masculinity — the topics that most Black men don't talk about." Parham and Simons see their podcast as a way to teach their community not only how to be self-sufficient but also to inspire them to help others in need. "We want to empower the people that are listening to go out and do something," Simons said. "We are giving an authentic Black experience — a real free Black expression," Parham added. They also frequently discuss problems in Oakland and the changes they want to see. Parham and Simons said the basic needs of residents are not being met, citing the Oakland Unified School District slashing its budget, residents getting pushed out of their longtime homes, and the ever-growing homelessness crisis. "The government has no moral conscious," Simons said. Despite the popularity of Hella Black, Parham and Simons have struggled to record episodes on a consistent schedule due to the lack of financial resources to pay for equipment and studio space — not to mention their personal and professional lives: Simons is an educator, while Parham works in communications. One way they've generated revenue is through Patreon, which allows people to support a business via a monthly subscription. So far, they have the monetary support of 86 "patreons," for a total of $538 per month. They have extended episodes for their Patreon supporters, while still providing the podcast free of charge on iTunes and SoundCloud. They know that they will eventually need sponsors to grow, but they don't want to go after just anyone — instead, they want to partner with local Black-owned businesses. Besides their podcast, Parham and Simons also co-founded the People's Breakfast Oakland, a project dedicated to helping feed the homeless population in West Oakland once a month. So far, they have fed more than 800 people, with money raised by spreading the word on social media. As part of the People's Breakfast program, Parham and Simons have also donated hygiene packages and, on hot summer days, countless cases of bottled water. These two projects encompass what Parham and Simons are all about — political education, awareness, and the empowerment of the Black community. They also see a future for the country thanks to the younger generation. "The empire is crumbling," Simons said. "People, especially youth, they ain't rocking with capitalism like they were." "I work with high school students, and the perspective they have in life at 15, 16 — I didn't get that 'til I was 22, 23," Parham said. "Imagine being raised in this movement." They both want to motivate and lead by example, and have young people listen to what they have to say. They have no hidden agenda — they want to help their community, "for the people, by the people," Simons concluded. The printed version of the story misspelled Blake Simons' last name.